Worldwide Lawyers are delighted to announce that we will be back again as an exhibitor at the fabulous A Place in the Sun Live overseas property exhibition, this time in Manchester! The official exhibition of the overseas property TV programme will take place at Manchester Central from Friday 11th to 13th March 2016 . It will be the 2nd time the exhibition has been to Manchester and will be Worldwide Lawyers’ first time at the Manchester show. If you are looking to buy a property abroad, the A Place in the Sun Live exhibition is a great place to carry out that all-important research and meet with us and the other overseas property professionals that will be able to help you on your journey. The exhibition is also be a great place to find your ideal property. Exhibitors include estate agents from all across Spain including the Canary Islands and the Balearic Islands as well as estate agents from France, Italy, Portugal, Turkey, Cyprus, Greece, Florida and many more! The exhibition features a number of free advice seminars with experts from the vital professional services including expert advice on legal, financial, tax and currency matters. There will also be the opportunity to take part in Question and Answer sessions with experts from across the industry. A Place in the Sun TV presenters Amanda, Jasmine, Jonnie and Laura will all be at the exhibition to to share their experiences and offer their tips for successfully buying overseas property. You can even take the opportunity to meet them face-to-face (and perhaps grab a quick selfie!) at the magazine signing sessions. 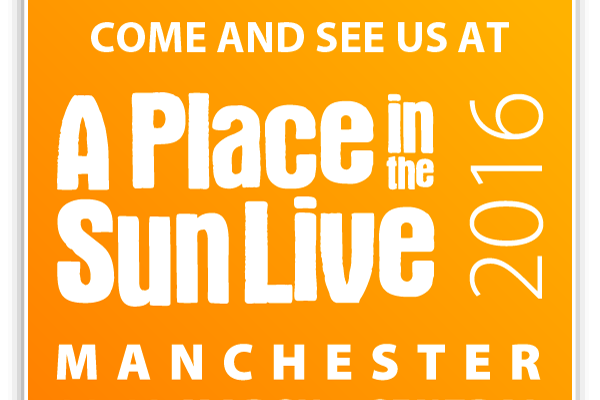 Worldwide Lawyers are currently able to offer some FREE tickets for the A Place In The Sun Live exhibition at Manchester Central on 11th-13th March 2016 – all you need to do is click on the A Place in the Sun picture bar below. So why not come and see us at A Place in the Sun Live in Manchester and see how we can help with your overseas legal needs! WE WILL BE AT STAND D11.